Dinner service was over. Time to finally make myself some dinner. It was almost always the same. Blast some onions in a pan, add spiced butter, some bits of lamb, a few chiles. Dip a big spoon into our house spice mixture, toss, toss, toss. A few tomatoes, a splash of red wine. Boil like a volcano for just a minute, then you’re done. Tibs. This was my nightly routine at my first restaurant job, at an Ethiopian place called The Horn of Africa, in Madison, Wisconsin, back in 1992. The Horn was owned by an Eritrean woman named Meselesh Ayele, and the little bar at the back of the restaurant was a sanctuary for the expatriate African community of Madison — yes, one existed. They were mostly students, researchers or professors at UW. I learned a lot drinking with that crew. Once the restaurant’s dinner service was over, which normally wasn’t that late, I’d make myself some food and take a spot at the bar. It wasn’t long before this guy from Djibouti called me out on my menu choice. I forget his name, but he had this huge, booming voice like that Jamaican dude from the 7-Up commercial in the 1980s, only with a slightly French accent. I use to piss him off my calling him “My Favorite Frenchman,” since the French basically owned Djibouti. 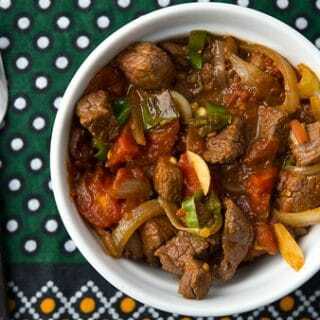 Tibs is the name for one of the cooler Ethiopian dishes out there. 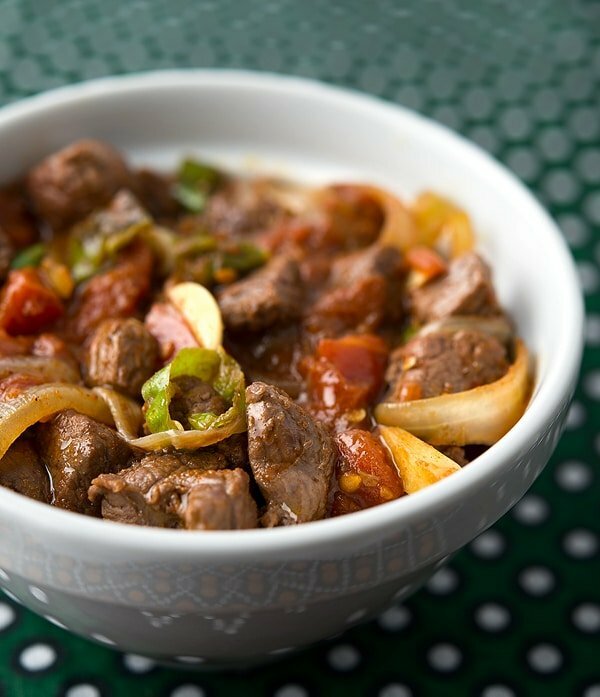 It’s a hybrid stir fry and stew that comes together in an instant, is meaty, rich and can be spicy as hell. Served with bread, rice or, more properly, injera flatbread, it was and is my favorite Ethiopian dish. 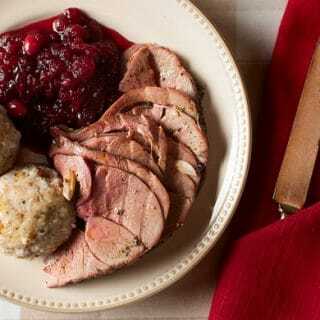 I always made it with lamb, but we also served it with beef — and now I use venison. I remembered how to make it from back then, but I never had an actual recipe. So when I went looking, it took some time. I finally created the recipe below, from an amalgam of recipes, the best of which is in a little book called Exotic Ethiopian Cooking: Society, Culture, Hospitality, and Traditions. It’s hard to find, but it you do, buy it. It’s the best Ethiopian cookbook I know of. Those were fun days. I was a graduate student, cook, rookie journalist and distance runner. I worked hard and played harder. Tibs was my go-to fuel back then, and I am glad to be able to bring it back. When you read through this recipe, I know it sounds like a lot for a simple plate of food, but if you do this, you will not be sorry. The flavors are exotic, mesmerizing and addictive. And once you have the basic ingredients, they all last for months. So you can make it again. And again. This dish is super easy to make, but you do need a few unusual ingredients and spices, and you need to have everything set to go before you start cooking because it comes together very fast. First, you must get yourself some Ethiopian berbere. It comes as either a spice mixture or a paste. You can buy it online or in places like Whole Foods or Cost Plus Market, or you can make it yourself. You'll also need clarified butter, although this tastes more authentic if you make your own Ethiopian spiced butter. Of the many spices listed in the ingredients, the most important is the fenugreek. It is this spice that makes the version of tibs we served at Horn of Africa different from most others. Get the saute pan or wok very hot. Stir-fry the onions without the butter for a few minutes, until they char just a little on the outside. Add the spiced butter and the venison. Stir-fry hot and fast until the outside of the meat is brown but the inside of the meat is still very rare. You need to do this on as hot a burner as you have. Do it in two batches unless you have a very large wok or pan. The moment the meat has browned, add it all back into the pan along with the spices, garlic and chiles. Stir-fry another 30 seconds or so, then add the tomatoes and the wine. Toss to combine and let this cook for a minute or two. 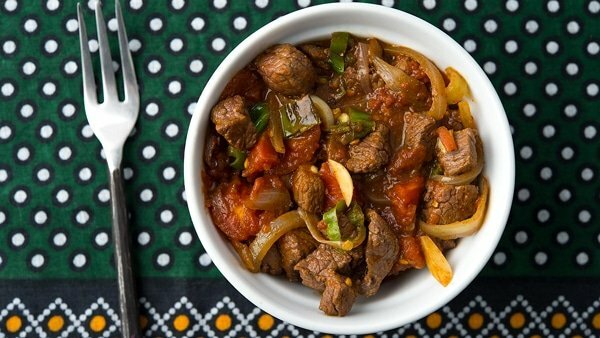 Serve at once with bread or injera. 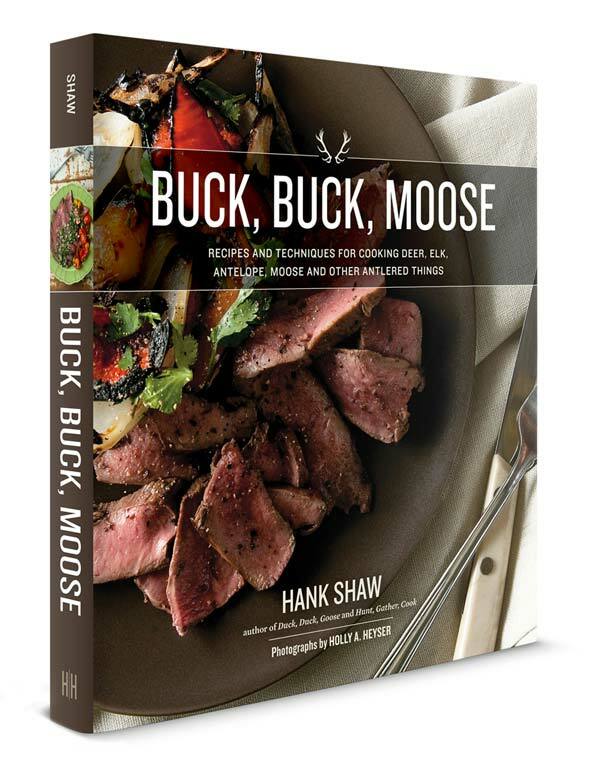 You can find recipes for every variety and every cut of venison, right here on Hunter Angler Gardener Cook! 1. I didn’t have niter kibbeh and used regular butter instead. This worked well since the other spices still give it a nice kick. I might try making niter kibbeh in advance since other Ethiopian recipes call for this. 2. Used 2 lbs of pre-cut beef stew cuts from the supermarket since I didn’t have venison. 3. I’m a wuss when it comes to hotness, so I only used 1 Serrano which adds more kick than it already has from the spices. It was still a tad hot for me, so I added dabs of sour cream to my plate serving. I wouldn’t add sour cream to the entire batch since people will have different tolerance for heat. Plus, traditional tibs doesn’t have sour cream. 4. Served with rice. Injera is challenging to find/make (I’m in lower slower Delaware) unless you’re willing to order the ingredients and make it yourself. That’s a long process unto itself. This recipe is a winner! I had to make niter kibbeh and order a few of the spices just for this recipe (they weren’t available locally) and I am so glad I did! Hank’s tibs come together beautifully. This meal comes together fast enough for weeknights and satisfies in hot or cold weather. Berbere and fenugreek were new to me, but they’re both now staples in my meat seasoning repertoire. Make this, you won’t regret it! All the spices are available from Penzey’s at penzeys.com. If you haven’t tried their spices, you are in for a treat. I have compared them to co-op spices, high end grocery store spices and ethnic store spices. Penzey’s is fresher and more aromatic every time. And they come in small as well as larger jars so you don’t buy a pound of berbere.